Placemaking or space wasting? 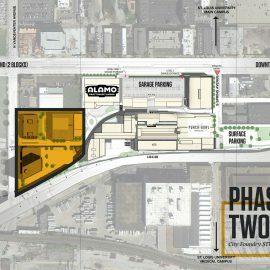 That is a question sure to be asked by many regarding a new eight-story parking garage and connector being built near the CWE MetroLink station. 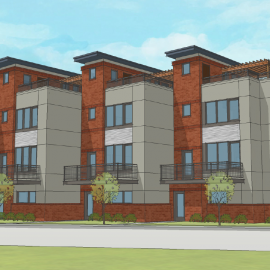 KAI Design presented a zoning request to the City in March regarding the project. The new garage will be sandwiched in between two existing parking structures off Duncan Avenue between Newstead and Taylor. The East-West Connector project is a component of the billion-dollar BJC/Washington University Medical Center expansion, and will feature construction of a one-third mile extensive skywalk. According to documents the connector will be a 13-foot wide tube elevated to a height of 33 feet. It will negotiate four parking garages before entering the medical center proper. The skywalk will run west along a Metrolink right-of-way adjacent to the new 3,022-space garage. It then moves north on Taylor Ave. to west on Children’s Place, where it runs alongside the 700-space School of Medicine Metro Garage. The connector ends at S. Euclid near the BJC Institute of Health, and the Michael Van Valkenburgh designed Hope Plaza featuring a Maya Lin designed circular fountain. Other notable buildings adjacent to the connector route include a 213,000 square foot College of Pharmacy academic building currently under construction, the Parkview Building, Storz Building, and the Eric P. Newman Education Center. Other major aspects of the project potentially include a new traffic road, and revamped entrance/exit to the Children’s Hospital employee garage. Construction is expected to be completed by late summer of 2015. The Campus Renewal Project is a decade-long effort to remake BJC/Washington University Medical Center with new development and significant renovations. The 16-block campus includes Barnes-Jewish Hospital, St. Louis Children’s Hospital and the Washington University School of Medicine, among other healthcare organizations. The first phase is now well underway. It includes an expansion of Children’s Hospital and Siteman Cancer Center. New space for university faculty practice offices and clinics, parking, and additional green space have also been proposed. A new research facility on McKinley Avenue at Taylor is currently under construction. 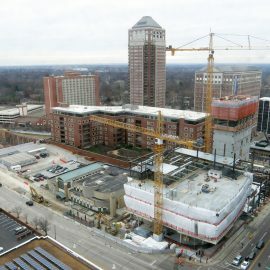 According to the Washington University website, “Campus Renewal encompasses the three institutions with an overall focus on improving the patient and family experience from both a clinical and campus perspective.” The garage and skywalk development site is also situated within the boundaries of the Cortex innovation district. Cortex is a partnership of major institutions based in St. Louis including Washington University and the Barnes-Jewish Hospital Foundation. The 240-acre district is an actively developing hub for life sciences research, innovation, and commerce. Nearly 500,000 sf of research space, and a 2,450 space parking garage, is being planned several blocks to the east. That project is near the Ikea, which should be under construction this fall. Contrary to most past incarnations of research parks as stark suburban districts, Cortex has expressed interest in becoming a neighborhood of perpetual activity, aware of its urban location. Dennis Lower, president and CEO of Cortex has stated the district has plans for creating a sustainable, walkable, twenty-four seven community. Noted certified planner Phil Myrick was hired in 2012 to help Cortex realize this goal. Myrick is a Senior Vice President of Project for Public Spaces. The nonprofit planning, design, and educational organization identifies itself as the central hub Placemaking. The global movement reimagines public spaces as the heart of every community, in every city. 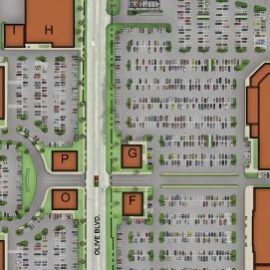 However, one prominent nextSTL design source noted the skywalk is unattractive, anti-urban, and will remove the medium density pedestrian traffic from Taylor. According to the source Taylor Ave. is the optimal connector street between the lively CWE entertainment district and bustling Grove. Removing pedestrians from the street, instead of investing in the street, could be a negative. Urban Chesnut’s Grove Brewery and Bierhall at Manchester and Taylor, a few blocks to the south, opened in February, and could serve as an ideal draw between the two districts. 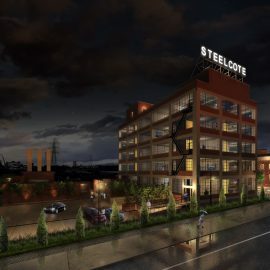 A $10 million renovation of the former Renard Paper Co. 80,000 sq. ft. warehouse gives the brewery enough room for expansion that could increase production to 100,000 barrels annually. Comparatively, Schlafly, long the largest craft brewery in St. Louis, produced approximately 56,000 barrels in 2013. An attempt to reach BJC vice president of corporate and public communications June Fowler was unsuccessful.